When Mrs Russell first visited the showroom wanting to update her tired, old kitchen into something more traditional with a country feel we knew we could provide the answer. Creating a functional space with all of the elements of a country feel was an exciting task and we set to work with the design. Keen to push forward with the german quality and incorporate some of her own ideas and styles, we worked together over a few showroom and home visits to create the ideal kitchen representing our expertise and her styles and tastes. 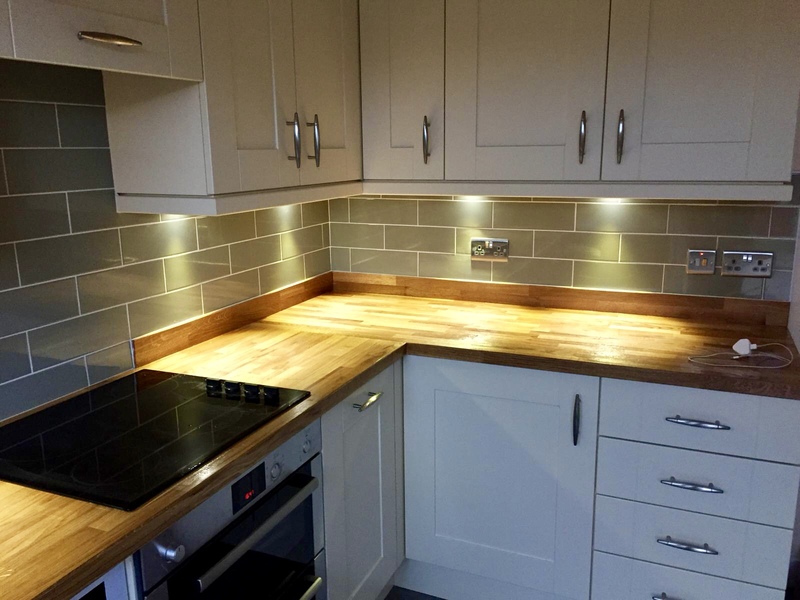 The clear selection of colours and door samples at Kitchens By Design made the choice easy for Mrs Russell and Sentia Cream stood out for her straight from the off. 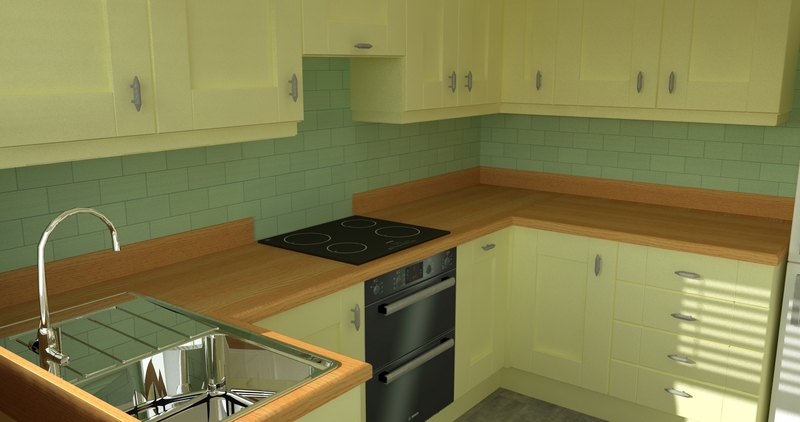 With this choice made almost instantaneously, our designer Jamie complimented this idea with a Solid Oak Worktop and a Sage Green Splashback to lift the room and create a wonderful country home feel. Gone were the old white cabinets and white tiles and what followed was truly beautiful. Being elite dealers of Moduleo and Amtico, we presented the client with hundreds of vinyl flooring options that would compliment the look we were trying to achieve. We opted for Moduleo Jetstone which is a fantastic grey tile and looked incredible against a cream and sage backdrop. After creating a 3D render for Mrs Russell to view, the entire kitchen came to life infront of her very eyes and we knew that this was the design for her. 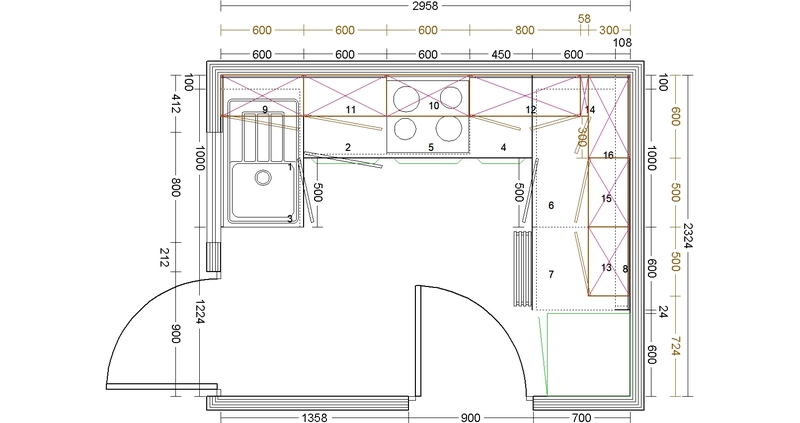 The freedom of layout was tricky with it being a tight space, however we maximised storage and updated the look with the latest Bosch appliances to create a kitchen that will be with her for years to come. We would like to thank Mrs Russell for choosing to work with all of the team here at Kitchens By Design to create her dream kitchen and we hope you love the new space!